Summer in Idyllwild, an ideal type to swim! The community pool on the Idyllwild Arts campus is now open to authorized users. The pool is open seven days a week with enhanced safety with active lifeguards on duty. 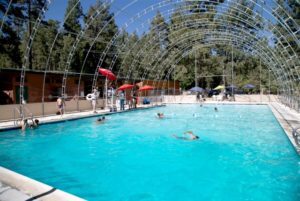 Who may use the Idyllwild Arts Pool? All current Associates! IAF staff and faculty, and Summer Program attendees while their program is in session. Not an Associate yet? The Associates of Idyllwild Arts’ mission is to support the students of the Idyllwild Arts Academy and Summer Program. One great benefit of being an Associate is use of this beautiful pool. If you are interested in becoming a member, click the membership tab above. Individual memberships start at $100 and Family memberships begin at just $200 per year. Enjoy the pool while supporting the arts students of Idyllwild Arts. Here are the pool hours: As said above, there is now a minimum of one active lifeguard on duty at all times and many times up to three. Access keys are no longer needed. While swimming in a group of three is no longer needed, try to swim with a buddy.